Now that the holidays are behind us, we all want to give you another chance to get out of the house with your friends and neighbors for some additional fun and fare. This month we decided to do a Taco night. We’ll provide the basic taco fixings and invite anyone to bring any additions that they may feel will spruce up a basic taco into an exceptional taco. We’re all waiting to give it a try. Bring your own beverage and come share some food and time playing games or just sitting by the wood stove. Last month I played a new game for me, it’s called “farkle.” A dice game where you can take chances and get lots of points or sneak by being conservative, which is what I did and was actually in the lead at one point, but when the end was in sight the dice flew with abandon and the crazy scores mounted up, the winner being a BES student. I’ve been farkled. We did manage to get a new comer to join in a cribbage game. We’ll keep trying. A couple of guitar cases showed up but remained closed as everyone enjoyed playing the games. Home rollin bowlin continued to be popular as there’s no limit to the number of people who can play. The following students in Grades 4-8 at the Barnstead Elementary School have earned High Honors or Honors for the First Trimester. Students who have received A’s in all of their subjects qualify for High Honors. Those students who have earned A’s and B’s in all of their subjects qualify for Honors. In addition, students qualifying for High Honors and Honors must have received grades in effort and conduct that are average or above. Starting in January the library will be providing a Quiet Study time for students every Friday from 12-2pm. We offer free Wi-Fi, computers, and many places to settle in and study comfortably. The library is starting a monthly Ugly Book Makeover Contest! This month’s picks are “Ribsy” by Beverly Cleary for kids and “Animal Farm” by George Orwell for adults. Your original artwork can be submitted to the front desk by January 26th and the winner will be chosen on our last open day of the month. The winners will receive a Sarah’s Book Nook gift card and the honor of having the book recovered and displayed with their artwork! Love books and dogs? We have the perfect activity! Register to read to Mack, our very special Reading Therapy Dog. Mack will be at the library on January 16th from 3-4pm. Sessions run for 15 minutes per family. Come in to the library or call 269-3900 to sign up for a session. On Thursday, January 17th the library will be holding a Beginner Sewing Workshop at 6pm. Participants will be learning to sew and making monogram throw pillows. Preregistration and a $10 supply fee are required. Please bring your sewing machine if you have one, limited extras are available. BARNSTEAD- Rena Grace George (Cookie) Graves, 76, most recently residing at Merrimack County Nursing Home in Boscawen, passed away on Wednesday, December 26, 2018, surrounded by her family at Concord Hospital from a short illness. Rena was born on April 11, 1942 in Lynn, MA, the daughter of the late James George and Hazel Mae (Ransom) George. Rena was educated in local schools graduating from Lynn Classical High school. 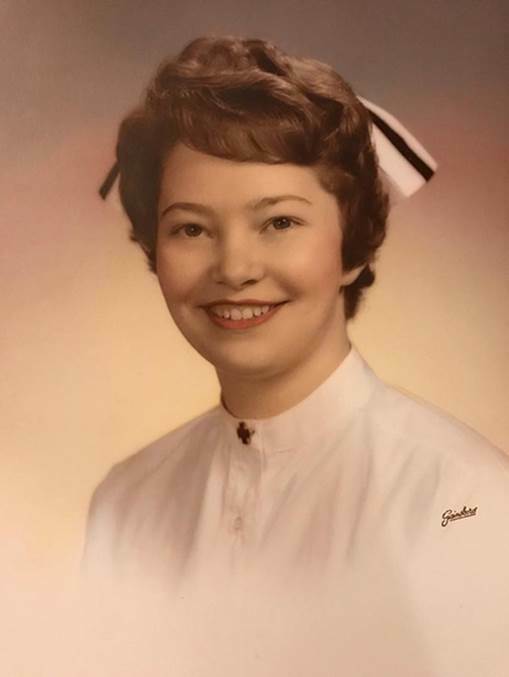 After graduating from High School she continued onto New England Baptist School of Nursing, upon completing the program she became a licensed RN in 1960 and continued to practice into the early 2000’s. In her youth Rena was an avid horseback rider enjoying trail rides from Haverhill, MA to Gilmanton, NH. She also enjoyed camping and waterskiing. Her first marriage in 1963 was blessed with five children. Following the dissolution of that marriage she married her high school sweetheart and love of her life on December 30, 1971 William (Bill) Alfred Graves son of Harold and Belle (Foss) Graves of Haverhill, MA. Shortly after her marriage to Bill the family moved to Haverhill Mass. where she continued her career in nursing at the Kenoza Nursing Home as a nursing supervisor until 1977 when the family moved to Center Barnstead New Hampshire. Rena worked at Pittsfield Box and Lumber, Mountains General Store, and Brock Children’s Home. It was her work at the Brock home that inspired her to offer respite care in her own home which then lead to her and Bill establishing their own foster home which they aptly named, “Cornerstone Children’s Home.” They fostered severely handicapped children who were wards of the State, these children became part of the family. Even after the loss of both of her legs due to compilations from diabetes Rena continued administrative and care duties in the home until Bill’s passing in 2014. Due to Rena’s failing health she was unable to maintain the home following Bill’s passing and moved to the Merrimack County Nursing Home. She thrived at MCNH. She passionately advocated for residents who did not have a voice, she was named “Resident of the Year” in 2017. At the nursing home she continued using her gifts as a master quilt-maker crafting quilts for the gift store and teaching others how to quilt. She also could be found reading or surfing the web on her “Apple iPad” YouTube was her favorite. She enjoyed opening her room to other residents and offering a listening ear, a hug, a quilt to snuggle with, or a snack from her constant supply of chocolate, pickles, and cheese-balls. Her tremendous sense of humor and patience with her children’s teasing and practical jokes will be greatly missed. Rena was a woman of deep faith in God. Throughout her life, whether she was in church or sitting around a table with others, she loved to study the Bible and spend time in prayer, and singing. She looked forward to spending eternity in the presence of her Savior, Jesus Christ. Rena is survived by her five sons; Douglas Graves and his wife, Stephanie of Boscawen, Michael McMahon and his wife, Patricia of Rockland, ME., James McMahon and his wife, Tammy of Middletown, PA., Keith McMahon and his wife, Beth of New Brunswick, Canada; a daughter, Heather McMahon Topouzoglou and her husband, Andrew Topouzoglou of Derry, NH; thirteen grandchildren Melissa (McMahon) Edmiston and her husband, Stephen of San Mateo, CA, Ashley (McMahon) Cummings and her husband, Andrew of Newark, OH, Nathan McMahon and his wife, Tykea of Hoover AL, Emily McMahon of Rockland, ME, Joshua McMahon and his wife, Joanna of Marietta PA, Kaylee McMahon and Kelsey McMahon, both of Middletown, PA, Will McMahon and his wife, Ashley of Standish, ME., Collin McMahon and his wife, Vashti of Parkers Cove, NS, Hannah Kingston of Waterville Valley, NH, Samuel Kingston, of Brooklyn NY, Jakob Graves of Andover and Tyler Graves, of Boscawen; a sister, Edith Miller of West Newbury, MA; two nephews, Stephen and Gary Miller; and eight great grandchildren. In addition to her family she leaves her dearest lifelong friend since first grade Lurlyne E. Murray of Port Charlotte FL. Their friendship endured through all of life’s adventures. She also held a special place in her heart for David Finethy of Barnstead, NH who she considered as another son. In addition to her parents and her husband, William, Rena was predeceased by her daughter, Patty Beth McMahon in 1970. A Memorial Service was held on Saturday, January 5, 2019 at the Center Barnstead Christian Church, Center Barnstead. Spring Burial will take place in Pine Grove Cemetery, Gilmanton Iron Works, NH. Rena was a strong supporter of cancer research and treatment. In lieu of flowers the family asks that you make donations to Dana Farber Cancer Institute Memorial Donations, 10 Brookline Place West, 6th floor, Brookline MA 02445. Wilkinson-Beane-Simoneau-Paquette Funeral Home & Cremation Services, 164 Pleasant Street, Laconia, NH is assisting the family with the arrangements. For more information and to view an online memorial go to www.wilkinsonbeane.com.